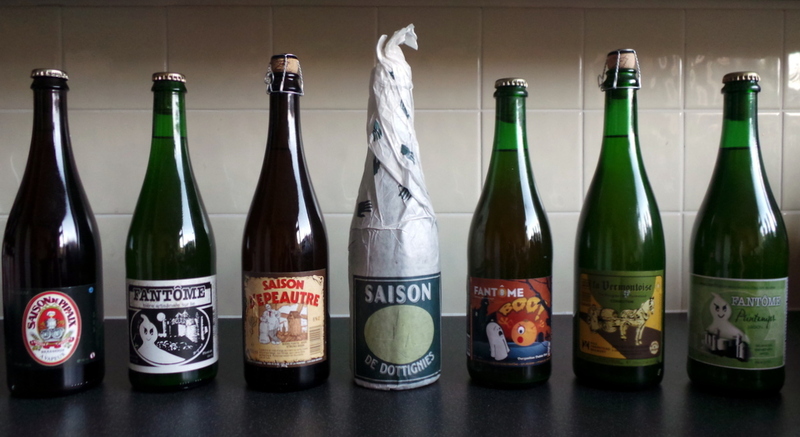 Lambics, old bruins, saisons and an assortment of oddities from breweries old and new made up my consignment of 23 beers, all of which were at least somewhat sour and most of which were in 75cl bottles. To my knowledge, many of the beers I acquired have never been sold in the UK. And even when they have they they’re often expensive, sometimes prohibitively so. Which is not to say my order was cheap. Still, following some good fortune I decided to go to town, picking up almost anything that took my fancy including some genuine rarities I’d probably not normally stretch to. 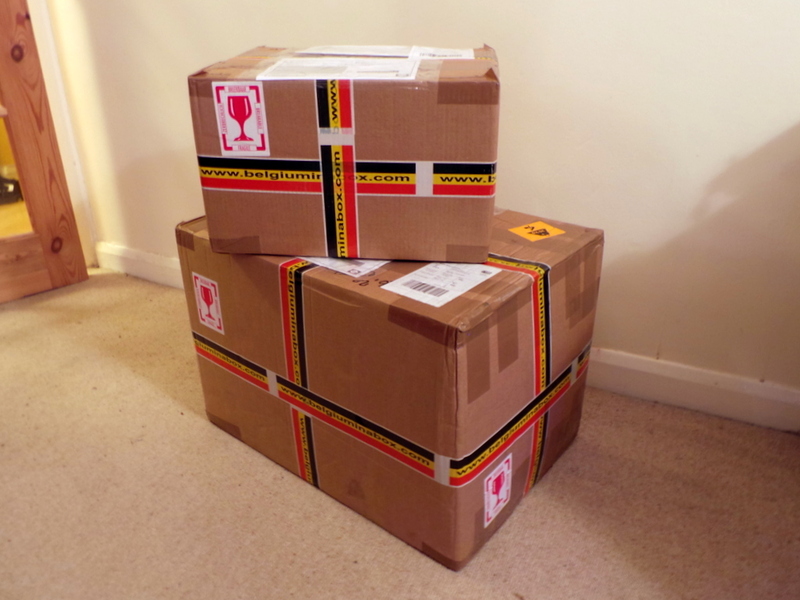 Large orders are really the best way to shop at Belgiuminabox from outside the country. The shipping charges are necessarily high due both to bottle weight and the effort that goes into packaging, each bottle sealed into its own foam collar for transit. It therefore makes sense to make the most of the allowance per delivery band to stock up on as many bottles as possible. Usefully this is all calculated for the buyer on the website. Delivery time was about two weeks but luckily I happened to be at home on the day of delivery so wasn’t confronted with the need to collect the two weighty boxes from a distribution depot. 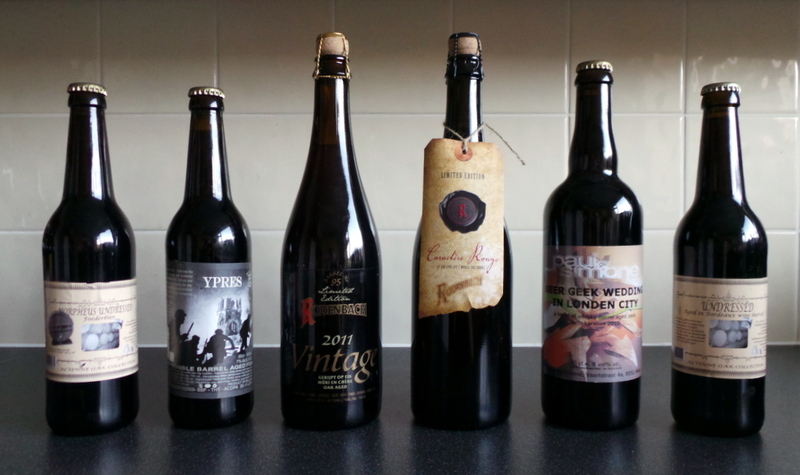 Suffice to say the “unboxing”of the beers was one of the high points of my 2013. For the record, the following bottles now await my attention. Note that stated years highlight the date of bottling (Belgiuminabox may have several) and are not part of a beer’s name, except in the case of Rodenbach Vintage and Struise Ypres. De Cam Oude Lambiek 2009 (5%) – rare old lambic bottled straight and still by De Cam of Gooik. De Cam Oude Faro 2009 (5%) – experimental faro made by adding “candy sugar” to very old lambic and leaving it to see what happens. Girardin Dominicus 2011 (5%) – apparently a sweetened faro-type lambic with added herbs. Moriau Oude Geuze (6.5%) – blend of young and old Boon lambics produced by Schoentens and named for a defunct gueuze blender that ceased production in the 1980s. Dekoninck Gueuze (6%) – another blend of Boon lambics this time made by Boon itself as a continuation of a beer previously made by another dead gueuze blender. Tilquin Quetsche à l’Ancienne 2013 (6.5%) – plum gueuze from the highly-rated new lambic producer. Rodenbach Vintage 2011 (7%) – the most recently released expression of the long-aged, undiluted version of the classic sour red ale. Rodenbach Caractère Rouge Batch 3 2013 (7%) – Rodenbach macerated with cherries, raspberries and cranberries and refermented in the bottle. Struise Ypres 2009 (7%) – described as an oud bruin barrel-aged for two years in French Burgundy barrels and one year in Wild Turkey bourbon barrels. Alvinne Morpheus Undressed Foederbier 2013 (6.9%) – a classic styled, but relatively new, Flemish red aged the traditional way in huge oak “foeders”. Alvinne Undressed Bordeaux Barrel Aged (6.9%) – a similar beer given extended ageing in a Bordeaux barrel. Alvinne Beer Geek Wedding in London City (8%) – seems to be a blend of dark ale and an “American-style wild ale” with some ageing in a Glenrothes scotch whisky cask. Fantôme 2011 (8%) – house special, classic golden saison (although not described as such). Fantôme Printemps Saison 2013 (8%) – variation on a traditional saison specially brewed for spring, to a one-off recipe. Fantôme Boo! 2012 (8%) – farmhouse ale for Halloween, seemingly made with smoked malt and added pumpkin. Saison de Pipaix (6%) – spicy saison flavoured with various “botanicals”, including star anise, ginger and black pepper. Blaugies Saison d’Epeautre (6%) – historical saison variant with spelt in the grist mix. Blaugies/Hill Farmstead La Vermontoise (6%) – another spelt saison brought up to date with Amarillo hops, a collaborative brew with Hill Farmstead Brewery in Vermont, USA. De Ranke Saison de Dottignies (5.5%) – a modern take on the classic saison. Vicaris Tripel-Gueuze (7%) – blend of a tripel-style strong pale ale with Girardin gueuze, made by De Proef for Dilewyns. De Ranke Cuvée De Ranke (7%) – another blend using Girardin lambic, this time with a sour pale ale made using Rodenbach yeast. Strubbe Leireken Wilde Vruchten Bio (5.2%) – ale made using six kinds of fruit, including raspberry, strawberry, elderberry, pomegranate, wild cherry and bilberry, may or may not be sour. De Dochter van de Korenaar L’Enfant Terrible (7%) – appears to be Bravoure smoked beer given several months of wine barrel ageing and progressing through various stages of lactic, Brettanomyces and wild fermentation. Really! Belgiuminabox’s selection reaches far beyond the very specific choices I made here. The great and the good of Belgian brewing across its full diversity are by and large present and correct. Whole crates of Trappist ale “Holy Grail” Westvleteren 12 are available should you have the urge and a big enough wallet to purchase one (impressive, given the secretive monastery’s somewhat restrictive sales policy). 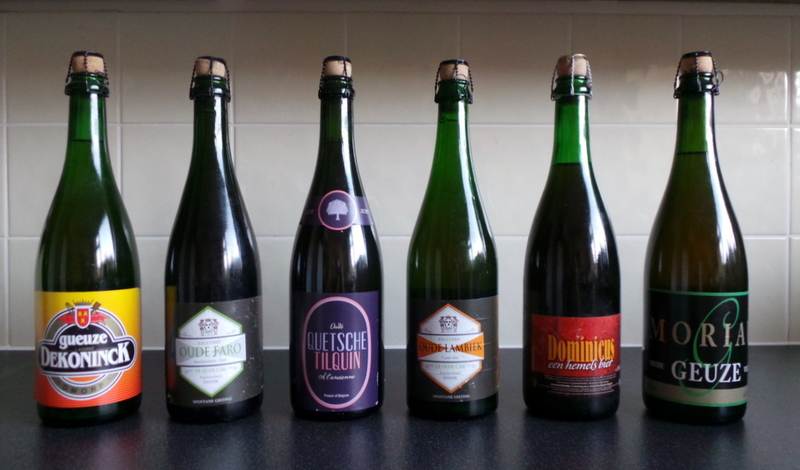 There’s even a selection of lambics-in-a-box, from both Girardin and Oud Beersel, which are definitely on my wish list. Many lesser known tipples are also to be found here. 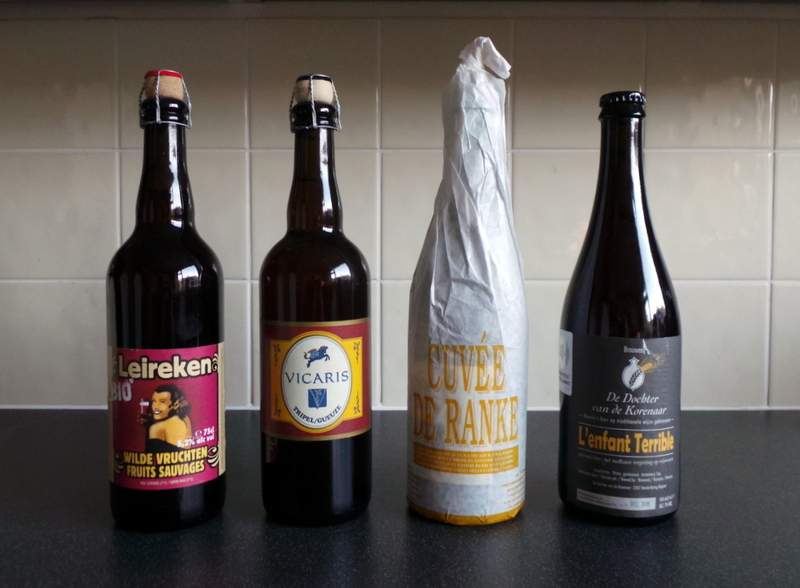 Whether good, bad or indifferent Belgian brews are usually worth sampling at least once. However, Belgiuminabox tends towards the quality and/or interesting parts of the spectrum, avoiding some of the most commercial brands and the occasional abomination (I prefer not to name names here). Pricing is generally competitive for UK buyers, especially for smaller bottles. Nor is the selection restricted to beer, with several interesting spirits and liqueurs on offer. These include the essential Belgian jenevers but also the Belgian whisky Goldlys and the infamous Armand’Spirit, a distillate of the considerable stocks of Oud Gueuze that were spoiled when 3 Fonteinen’s warehouse thermostat broke in 2009. I might throw in a bottle of the latter next time I order.